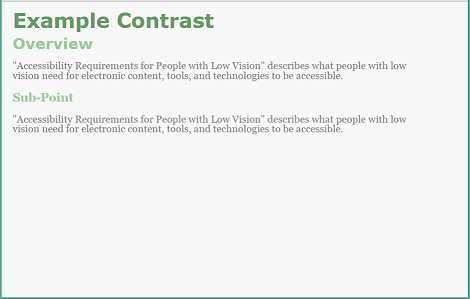 This document, Accessibility Requirements for People with Low Vision, describes what people with low vision need for electronic content, tools, and technologies to be accessible. It includes an overview of low vision and describes specific user needs. Additional information is available from Accessibility for People with Low Vision. 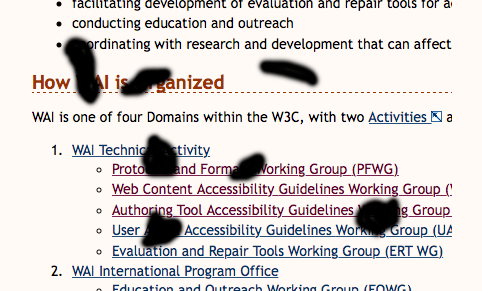 This is First Public Working Draft of Accessibility Requirements for People with Low Vision by the Low Vision Accessibility Task Force (LVTF), a Task Force of the Web Content Accessibility Guidelines Working Group (WCAG WG). It describes what people with low vision need for electronic content, tools, and technologies to be accessible, and provides a foundation for planned future work such as a gap analysis, potential WCAG 2.0 extension, and enhancements to other WCAG 2.0 support materials. This draft provides the overall framework and approach that the Task Force is planning for this document. Most of the information the Task Force intends to include is in this draft; however, there are several open issues that are not yet included in this draft. It is not yet copy edited or polished. The Task Force plans to publish at least one more Working Draft for public review after the content is finalized, and eventually publish it as a Working Group Note. Is the purpose and scope of the document clear? Does the Overview (section 2) provide sufficient explanation for readers to understand the basics of low vision related to electronic content and tools? Is any of the detail in that section unnecessary and can be left out? Is there information missing that we might want to add (while still keeping the section focused on relevant information)? For each of the User Needs in section 3, is the issue and user experience clearly yet succinctly explained? Are there any points that need better explanation? While this is an incomplete draft and the Task Force is aware of some user needs that are not yet included, we welcome comments on additional user needs to include in the document - either now or after we publish the complete draft for review. The Editor's Draft has in-progress updates since this draft. Additional information: history of changes, open issues, e-mail comment archive. We welcome comments on this draft via e-mail to public-low-vision-comments@w3.org or the GitHub repository. Please create separate GitHub issues or pull requests for each comment, rather than combining multiple comments together. Please submit comments by 14 April 2016. About this Draft: There are several open issues that are not yet included in this draft. Some images and image descriptions will be revised. This draft is not yet copy edited or polished. 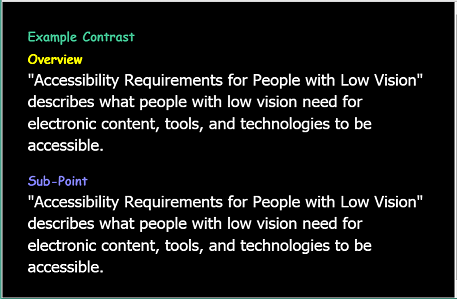 This document, Accessibility Requirements for People with Low Vision, describes what people with low vision need for electronic content, tools, and technologies to be accessible. It includes an overview of low vision and describes specific user needs. It does not set priorities on issues. User needs can be met at several levels, including hardware, operating systems, user agents (such as web browsers), extensions, plug-ins, assistive technologies, and content. This document does not specify responsibility for meeting user needs, and it does not set technical requirements. This document is intended to provide the background for developing guidance on making web content, tools, and technologies accessible to people with low vision. In a fact sheet on visual impairment and blindness [ WHO-VI ] the World Health Organization (WHO) estimates that there are 246 million people worldwide who have low vision and 39 million people are blind, indicating that 86% of the people with visual impairments have low vision. Most low vision is caused by eye diseases and health conditions such as cataracts, glaucoma, and diabetes. These are more prevalent in older people. Some low vision is from birth defects or injuries. Low vision encompasses a wide and variable range of issues across people, and even a single individual may experience multiple separate issues. Many eye diseases cause progressively worsening vision, and it is not uncommon for a person’s vision to deteriorate from good vision to blindness over several years. Some causes of low vision can be improved through surgery or medication, and it is not uncommon for someone to have deteriorating vision over several months, and then experience improved vision after treatment. Starting around age 40, most people have declining vision that is not caused by disease, including decreasing ability to focus on text that is close, decreasing color perception, decreasing contrast sensitivity, and more. Some of this is “correctable” with glasses or more lighting, and some is not. Many people with decreased vision due to aging do not consider themselves as having a disability. Visual acuity is the clarity or sharpness of vision. It is generally dependent on the functioning of the retina part of the eye and of the interpretation of the brain. Measurement of distance visual acuity is based on a standard of 20/20 (6/6 in metric). Some low visual acuity can be corrected with glasses, contact lenses, or surgery – and some cannot. Therefore, some people will have blurry vision (low visual acuity) no matter what. Many people with low vision have extreme sensitivity to light (called photophobia). Bright light makes it difficult or impossible to see, and causes eye pain and headaches. For some people, the normal brightness of a computer screen with a light background is not readable and painful. They need to change the background to a darker color. Contrast sensitivity is the ability to distinguish bright and dim areas of images, for example, to discern text on a background. 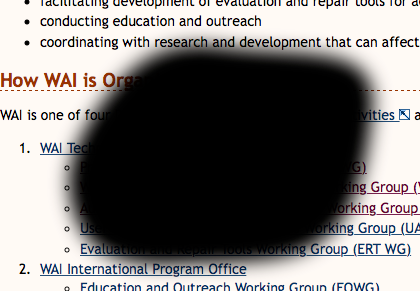 A common accessibility barrier for people with low contrast sensitivity is gray text on a light background. Contrast is based on brightness. Colors that look very different (for example, red, blue, green) can have similar brightness, and not provide sufficient contrast. Tools are available to determine the contrast ratio between colors. The area from which a person’s eye is able to gather visual information when looking straight ahead is referred to as the field of vision or visual field. People generally have a field of vision of approximately 180 degrees from left to right and 150 degrees up and down, with the sharpest vision in the central 5 degrees and color vision in the central 20 degrees. Some people have a smaller field of vision, which is called field loss. Central field loss: Vision is reduced or absent in the middle of people’s vision. Peripheral field loss: People only see in the central portion of their visual field, sometimes called “tunnel vision”. Other field loss: People have scattered patches of obscured vision, have a ring of field loss, have field loss in the left or right part of their vision, or other field loss. 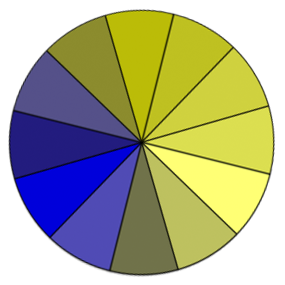 Some people cannot see certain colors well or at all, usually because of deficiencies in the cone receptors of their eyes which are responsible for color perception. This is commonly called “color blindness”, even though most people who are color blind can see most colors. It is rare that a person cannot see any color at all. Globally, approximately 1 in 12 men (8%) and 1 in 200 women have color vision deficiencies. [Draft Note: Reference to be added; some listed in References.] Color vision deficiencies are not classified as “low vision” or disabilities in many contexts. The Task Force plans to expand this section. Most people with low vision have multiple visual impairments. For example, people with macular degeneration usually develop central field loss (“blind spots”), poor visual acuity, low contrast sensitivity, and high light sensitivity. Other factors — such as inflammation, medication, fatigue, environment, and task — influence a person’s effective vision in a given situation. Fatigue is a significant issue for many people with low vision, particularly when they read text that is not displayed in an optimum way for their visual situation. Generally, the more a person needs to strain to read, the worse their visual fatigue will become. Some people can read for only a short time and then they need a break. Sometimes people have control over environmental factors, for example, they can change the lighting in the room, set the brightness of the device, move to a shaded location, or change the angle of the display. Sometimes people have little or no control over the environment, for example, when using a public kiosk. [Draft Note: The Task Force plans to change the content of this paragraph.] Tasks may also impact a person’s functional vision. For example, a person may be able to distinguish letters at a given point size on a vision test where they are reading only one letter at a time, but they cannot actually read blocks of text at that same point size. This is the difference between legibility and readability. Legibility is related to perceiving text by distinguishing letters. Readability is related to reading and comprehending textual information. Thus text could be somewhat legible to a person, yet not functionally readable—with effort that user could distinguish one letter from another, but could not effectively read sentences. Some low vision accessibility issues are directly related to functional vision and some are related to adaptations for visual impairments. For example, when a person with low visual acuity (and full field of vision) uses zoom or magnification, they have some similar issues as people with peripheral field loss — as considerable information may be moved outside of their field of vision as a result of their solution to reduced visual acuity. User needs varying widely across people who have low vision, and one user’s needs may conflict with another user’s needs. For example, an older person might need high contrast but that might be unreadable to a person with light sensitivity; a person with good visual acuity (clarity) and tunnel vision might need to make the text size small so they can see more words at a time to read better, whereas most people with low visual acuity need large text. It is not uncommon for one person’s needs to be different from day-to-day or even throughout one day; for example, when they are more fatigued, they might need larger text or a different background color. Task and the amount of information influences user needs. For example, when a person is typing an e-mail, they may be able to have smaller font because they know what is being written and are just skimming for typos; whereas when that same person is reading an e-mail, they need larger font because they do not already know the content. Thus users need to be able to adjust user interfaces to meet their needs. An individual's optimum display for readability often requires very specific adaptations. For example, a person with high light sensitivity and low contrast sensitivity needs to set background and text colors that are not bright and that provide sufficient contrast for them to discern the text. The characteristics of text that make it more or less legible and readable are highly inter-related; that is, one characteristic is dependent on other characteristics. 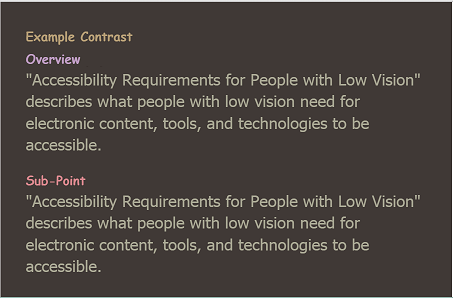 For example, a person with low contrast sensitivity might not be able to read small text with a contrast ratio of 5:1, but can read text at that ratio when then text is much larger; similarly, with some fonts a person does not need to increase the letter spacing, but with other fonts they do. 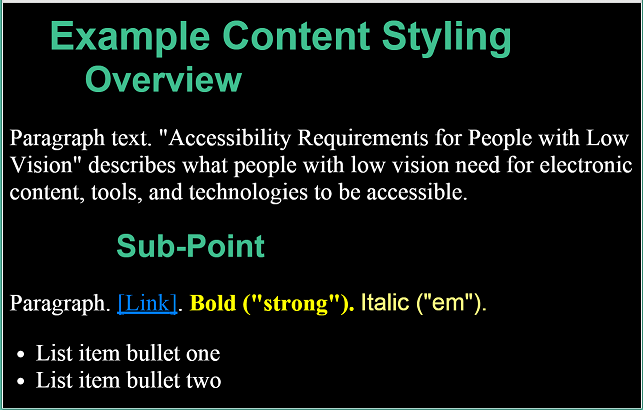 Additional User Needs will be added related to contrast and image accessibility. Each section briefly explains the issue and the user experience, and then states a specific user need after "User Need - ". User Needs that say “Users can...” indicate that users can change a setting. Brightness relates to luminance and luminosity. [Draft Note: The Task Force plans to link to additional information on this topic.] This document uses "brightness" for simplicity. Bright light from a screen or other sources prevents some people with low vision (including those with photophobia and with reading disabilities such as dyslexia) from reading and causes pain for some people. Some people turn down the brightness of their screen or use an overlay. Users can set the overall brightness of a display. As mentioned in the Light Sensitivity section, some people need low brightness, especially for backgrounds. Some people who need low brightness for backgrounds also need low brightness overall and thus need low brightness text. Other people need high contrast between text and background, including many older people who lose contrast sensitivity from ageing. Some read better with dark text on light background. For some people, common color combinations or colors from a limited color palette work fine, for example, black text on white background or the inverse with white text on black background. Other people need to select more specific background and text colors. For example, people who need low brightness overall, need to select the specific background and text colors that provide sufficient contrast for them yet not too high brightness. Readable and optimal color combinations differs vastly among individuals and can even vary for one individual depending on conditions such as fatigue and lighting. 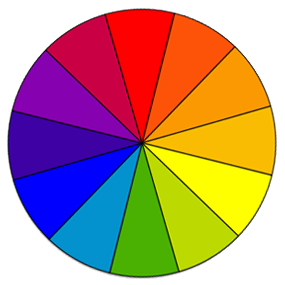 Users can set the background color and the text color from the full color spectrum. 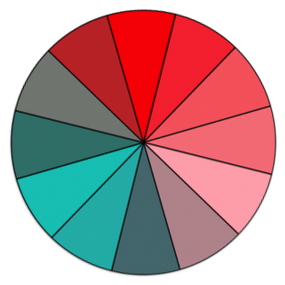 Color is not the only visual means of conveying information, indicating an action, prompting a response, or distinguishing a visual element. Tracking is following along lines of text, including getting from the end of one line to the beginning of the next line of text. This section includes rewrap, reflow, line length, and hyphenation. Tracking is also impacted by leading, justification, and margins and borders, especially when blocks of text are in columns or near other text. For many people, with and without disabilities, it is difficult to read when they have to scroll back and forth to read a line of text. When people with low vision increase the text size and the text doesn't “reflow”, they sometimes have to scroll horizontally several screens to read a single line of text. Additionally, the scrollbar and cursor is harder to find for some. Getting from the end of a line of text, scrolling back left, and then finding the beginning of the next line can take considerable attention. This degrades reading flow and comprehension, sometimes significantly enough that effective reading is not possible when horizontal scrolling is required. Blocks of text rewrap so that only one direction of scrolling is needed, e.g., for left-right and right-left scripts (languages), usually vertical scrolling and not horizontal scrolling. Script direction: Rewrap above and Reflow below are written for left-right and right-left scripts for now for simplicity. We'll edit it to make it generic to apply also vertically to top-to-bottom scripts as appropriate — if we can without complicating it too much, or change it to example only. script vs. language reference says “Languages don't have a direction. Scripts have a writing direction”. For many people, with and without disabilities, it is more difficult to read when they have to scroll from the bottom of a column of text to the top of another column. For some people with low vision, with multiple columns, they have to scroll up several screens to get from the bottom of one column to the top of the next. Additionally, the scrollbar and cursor is harder to find for some. Getting from the bottom of a column and finding the top of the next column can take considerable attention. This degrades reading flow and comprehension, sometimes significantly. Users can set blocks of text in one continuous block, instead of in multiple columns. For many people, with and without disabilities, it is harder to read very long lines of text than shorter lines. For people with a small field of vision, it can be even more difficult to read long lines of text, and from the end of a line of text, to find the beginning of the next line. People with good visual acuity yet small field of vision might want to set the text size small and the text area narrow so they can get more characters in their field of vision. 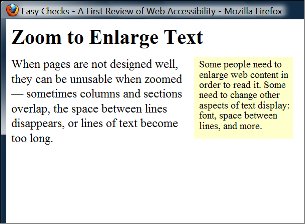 Users can set the line length for blocks of text. Often the easiest way to do this (for developers, designers, and users) is for users to resize text areas and the text rewraps to change the line length. For some people it is especially difficult to understand words that are hyphenated, and they need to turn off hyphenation. While primarily an issue for people with cognitive impairments, hyphenation becomes more of an issue when text size is increased, thus it is also related to low vision. Some people with very large text may prefer hyphenation on so that more characters fit on a line of text. Users can turn hyphenation on or off. Perceiving includes being able to recognize individual letters based on their characteristics, which is legibility, and non-text information and interface elements. This section includes text size, font, style, capitalization, and size of all elements. Spacing also impacts how hard it is to perceive letters. Some people need larger text in order to perceive letters. Although increasing size is most common, some people with tunnel vision and good visual acuity may prefer smaller letters so they can see more words at a time. Users can change the text size (font size) of all text, without zooming the entire interface. Some fonts/typefaces are more readable than others. For example, some people cannot read fonts with sub-pixel rendering. Note to tool developers: When providing users a list of fonts to choose from, present the font name in the font itself — e.g., Times, Veranda, Courier — so users can tell what each font looks like before choosing it. Users can change the font face (also called font family or typeface) of all text, choosing from a wide range of fonts including serif and sans serif fonts. For some people, bold text is easier to read. For some people, it is difficult to read blocks of text that is all underlined or italicized. 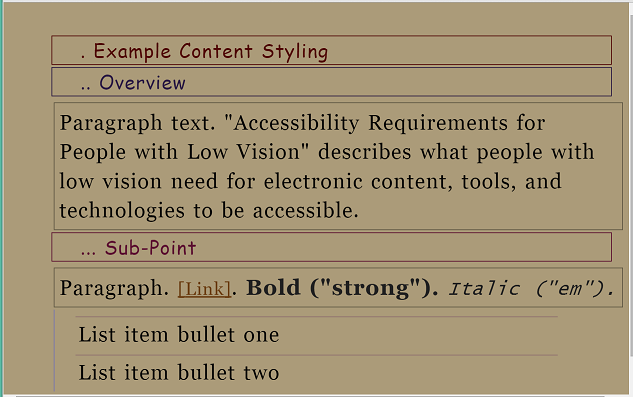 Users can change the text style (underline, italic, bold) of blocks of text. Text in all capital letters is more difficult to read for most people, with and without disabilities. Users can change the capitalization (all capital letters, small capital letters, sentence style) of blocks of text. Zoom to make everything larger. Increase the width of the text cursor, which is usually done at the operating system level. Increase the size of the mouse pointer, which is usually done at the operating system level. Users can change the size of all elements. Spacing such as space between lines and space between words impacts readability. This section includes leading, letter spacing, word spacing, justification, margins and borders, and spacing between elements. Leading is the space between lines in a block of text. It is also called line spacing and line height. Some people need more space between lines to be able to read text. Leading also helps with tracking. Users can change the leading (line spacing, line height) of blocks of text. Some people need more space between letters to read text. Users can change the letter spacing (space between letters/characters) of blocks of text. Some people need more space between words to read text. Users can change the word spacing (space between words) of blocks of text. Justification or alignment options usually include: left, right, full/both, centered. Users can change the justification / alignment (left, right, full/both, centered) of blocks of text. If text is close to edges, it is hard for some people to distinguish letters and it negatively impacts readability. Having wide margins around blocks of text helps some people focus on the text and not get distracted by surround text, images, etc. This is especially important for tracking when blocks of text are in columns or near other text. For people who need very large text, wide margins could make line length too short. 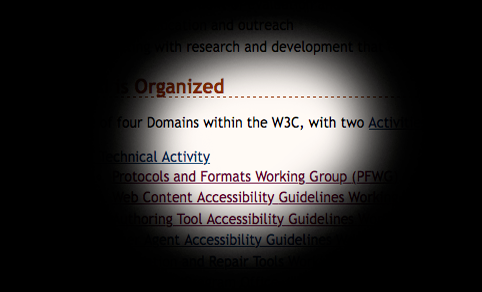 For people with tunnel vision, wide margins could make it hard to track text. 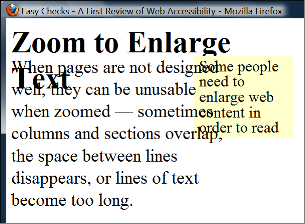 Therefore, some people might need borders to separate blocks of text instead of, or in addition to, margins. Users can change the margins (blank space) and borders — including line color, width, style — around blocks of text. Having additional space between unrelated elements helps people group related information. For example, having more space above a heading and less space below it, helps associate the heading with the text below. Spacing groups related elements and separates less related elements. Identifying elements is about distinguishing elements such as headings and lists. Some people change the way certain elements are displayed to make it easier to distinguish types of text, such as headings. If all text is increased proportionally, headings can become very large and bigger than people need to read the main body text. So some people prefer for headings to be smaller and they use styling such as font, color, and indentation to distinguish heading levels. The Task Force may provide additional image descriptions in this section - including a bulleted list of the user customization in the figures. Users can customize text differently for specific elements, such as headings, lists, and paragraph text. The point of regard is the area that the user is viewing. [Draft Note: More info is available in: UAAG 2 Glossary and IndieUI wiki. The Task Force will probably add a glossary definition to this document.] Proximity is the space between items. In user interface generally, proximity is about using space to group related content and separate unrelated content. As discussed in the Field of Vision section, some people with low vision see only a small amount of content and/or the user interface at a time. The Task Force plans to add additional information in this section related to point of regard and proximity. Sometimes people will be viewing content and need to change the display to read it better, for example, make the text larger. If the place where they are reading (called “point of regard”) changes much, they lose their place and, especially with a small visible area and large text, it can be very difficult to find their place again. Mouse hover changes point of regard, but is lost. Screen magnification user hovers over image, acronym, or other thing with pop-up. The pop-up is larger than their view. When the user scrolls to read it, it loses focus and disappears. The point of regard remains visible within the viewport when the viewport is resized, when content is zoomed or scaled, or when content formatting is changed. Related information — such as labels and controls, or matching tests in two columns, or feedback — is in close proximity. Feedback is in close proximity to the user’s visual focus. Dialog boxes and other such pop-up messages appear over the users point of regard. Users are informed of new information that may be outside of their view — such as a new browser tab opening in the background. Users know about and can find related information. When people increase text size, increase leading, or change other text display aspects through text-only zoom or other text settings, content that is poorly designed can become unusable. For example, with text areas in web pages, sometimes columns and sections overlap, the space between lines disappears, lines of text become too long, or text disappears. Fig. 14 Example showing that when text size is increased, the heading overlaps the main text, the main text overlaps the sidebar text, and the sidebar text is cut off at the bottom. Often it is best for text areas to automatically resize to fit the text, and for users to be able to change the size of text areas. When the areas cannot be resized to accommodate all content, usually a scrollbar should be available. See also the Rewrap for one direction scrolling section. When people use large fonts or lower screen resolution, it is not uncommon for dialog boxes to include information that is not in the viewport. In such cases, it is usually best practice for scrollbars to be provided for the dialog box. Scrollbars generally provide the additional benefit of communicating where the user is in an interface. Some users increase the size of mouse pointers in their operating system or with screen magnification software. These should not obscure tooltip text. Users can see all interface elements that are intended for users to see, including when users have changed display settings such as text size. It is uncomfortable or painful for some people to be in the physical position required for reading on a computer monitor, for example, some people with low vision need to be an inch away from the display. While some people have mobile devices, others have only a monitor that is difficult to move, or use a public terminal. Some people print so they can block out surrounding text; for example, they slide a sheet of paper down as they read to cover up the line below where they are reading. Some people need colored overlays. Sometimes people need to print text to use it away from the computer, for example, presentation notes, recipes, and repair instructions. Users can print content after customizing how the text is displayed.